Botswana is a party to the Convention on the Rights of the Child (CRC), the African Charter on the Rights and Welfare of a Child (ACRWC) but not the CRPD. The CRPD is the international human rights instrument that has accurately and comprehensively articulated the rights of children with disabilities and persons with disabilities generally. Article 4 imposes obligations on state parties to ensure and promote the full realisation of all human rights and fundamental freedoms for all persons with disabilities without discrimination of any kind on the basis of disability through administrative, legislative, research, advocacy and other measures. 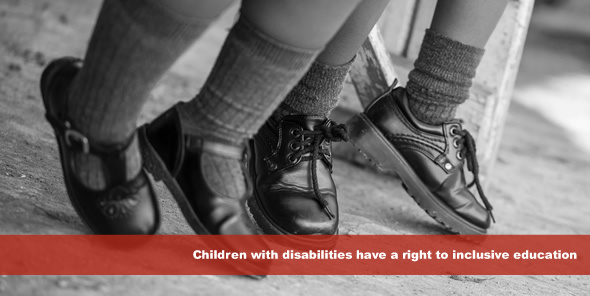 Unlike some other African countries such as Kenya and South Africa which have promulgated laws and developed jurisprudence that observe, respect and protect the rights of children with disabilities, Botswana does not have any legislation that guarantees such rights. This is the situation even though children with disabilities in Botswana are an extremely vulnerable group in need of special protection. The implication of an absence of disability legislation is that these children will continue to be marginalised and segregated in the educational system since they do not have any right to demand inclusive education. The World Bank in 2012 rated Botswana as a middle income developing country with a very small population of 2.004 million. The 2006 Botswana Demographic Survey indicates that there were 96,125 persons with disabilities in Botswana. With such a relatively small disability population one really wonders why Botswana has not provided an environment of reasonable accommodation and inclusive education for children with disabilities. Botswana is economically better placed to provide for children with disabilities than many other African countries, including Sierra Leone, which are striving to protect the rights of children with disabilities. For a very long time, parents of children with disabilities in Botswana have been anticipating the realisation of the rights to inclusive education as guaranteed in the CRPD but the present realities show that this is only a myth; a dream that has at best been documented in national policies. But children with disabilities are also human beings! They have rights just like other children! They have a right to inclusive education, for when they are neglected and segregated it is the entire humanity that has been discriminated against. Botswana should therefore take all necessary steps to guarantee the rights of these children; first, by ratifying the CRPD; second, by enacting specific disability legislation; and third, by taking practical measures to create a non-discriminatory society. Laws are enacted to guarantee rights, but true realisation of inclusive education goes beyond the law, it is a process that is not too early for Botswana to commence. Tejan Deen holds Bachelor of Arts (BA) degree and a Bachelor of Law LLB (Honours) degree from the Fourah Bay College, University of Sierra Leone. Tejan Deen is a Barrister in the Republic of Sierra Leone and an LLM Candidate at the Centre for Human Rights, University of Pretoria, South Africa. Tejan Deen has also worked with the Defence Office, Special Court for Sierra Leone, and also Amnesty International Sierra Leone. While you may be commending Kenya for having a legislation, I would be particularly cautious in this because the law in Kenya unfortunately places children with disabilities in special schools. Even though there has been debate over the years about the legality of these schools under, it beats the purpose of ratifying CRPD, having disability laws and then ignoring the very spirit of CRPD by placing children in special schools.Otherwise I liked the piece. Good work.